Remember that feeling of terror when a five-year-old version of you climbed aboard your tricycle before careening down a giant hill? That’s nothing compared to what François Gissy must have felt climbing aboard this adult-sized trike powered by a water tank pressurized to 6,000 PSI. When the valve holding back 35 gallons of pressurized rain water inside the carbon fiber-wrapped tank was released, the tricycle accelerated to 62 miles per hour in just over half a second. But by the time that tank was completely emptied, the tricycle, built from motorcycle and go-kart parts, reached a top speed of 162.2 miles per hour. Somehow a motorcycle helmet just doesn’t seem like enough safety equipment. 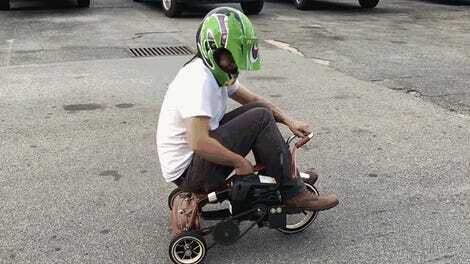 Is it time to downgrade (or upgrade) to a tricycle?